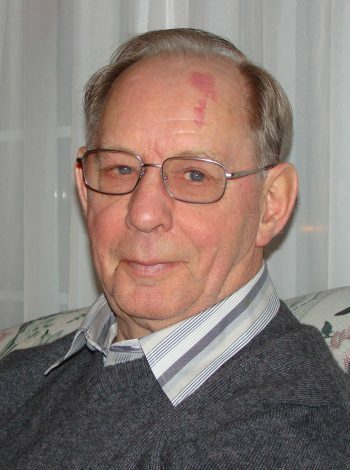 Passed away at home surrounded by family on October 2, 2018. Predeceased by his parents Samuel and Blanche Manuel, siblings Maxwell (Faith), Faith Matchem (Don), James and Fred, and sister-in-law Marilyn Manuel. Left with loving memories his wife of 56 years Eileen, children Jackie Manuel (Craig Cummings), Andrea Quinton (Mike), Colin Manuel (Heather Vallis); grandchildren Kyle Quinton, Riley Manuel, Liam Quinton; and brother Graham Manuel, and sisters-in-law Linda Manuel, Marion Harris (Gord); brothers-in-law Keith Day (Cindy) and Russell Day (Lynn); and special friends the Dawes, the Gillams, the Welshes, his poker buddies, and many, many extended family and friends. Visitation will be held from Carnell’s Funeral Home, 329 Freshwater Road, on Wednesday October 3 from 7-9pm, and Thursday, October 4 from 2-4. And 7-9pm. Funeral Service will be held from St. Mark’s Anglican Church, 203 Logy Bay Road on Friday, October 5 at 11am. Interment to follow at Kenmount Road Anglican Cemetery. In lieu of flowers, as he gave to all charities and collected for many, donations to a charity of one’s choice in Tom’s memory would be appreciated. Jackie & Family. So sorry to hear of your dad’s passing. Cherish the memories. My Goodness, So sorry to hear of Tom’s passing. our thoughts and prayers are with you at this difficult time. We were so saddened to hear of Tom’s passing. Our family has the best memories of Tom and his antics. He will live on in our in our hearts. We are thinking of you and sorry that we can’t be there today. We were absolutely shocked to hear about Tom’s sudden passing. The great times we shared over the past 45 Years will always be fondly remembered and never forgotten. We are currently out of town and cannot be there at his funeral on Friday. Sincerest condolences from both of us. Sincere condolences to you and your family on the passing of Tom. He was a dedicated person and will be really missed by the Scouting movement. Rest in peace Tom. Our thoughts and prayers are with you at this difficult time. God bless! I ran into Tom while out shopping in August and had a nice chat., so was shocked and saddened to hear of Tom’s passing.. Sincere condolences to you all. I just read in the paper the news of your father’s passing and want to extend sincere sympathy to you, your mother and all your family. I remember you from my teaching time at Macdonald Drive Elementary and recall what a wonderful student you were. I remember your mother as well. Hopefully happy family memories will comfort and sustain you in the days ahead. God bless you. We’re shocked and very saddened to hear of Toms passing. Our get togethers won’t be the same without him. We’re away, so we can’t be there for his funeral but we’ll be thinking about you. He will be missed by us all. Sincere condolences. Chris and I were shocked and saddened to hear of Tom’s passing. He was so kind and such a gentleman. We will all miss him. Our thoughts and prayers are with you all. With love. Sorry to hear of Tom’s/your Dad’s passing. May all your memories give you comfort. We are saddened to hear of Tom’s death. Tom and Eileen have been our longest standing neighbours for almost 48 years. Tom was always friendly and positive. He was a fine and decent man. Peter always enjoyed conversations with him and learned some useful things about snow blowers, amongst other things. We offer our sincere sympathy to Eileen and the family. I am so very sorry to hear about the loss of your father. I’ll be thinking of you and your family. Eileen and Family …. Dave and I were so saddened to hear of Tom’s passing . Our sincere condolences to all the family. Jackie and Craig, our sincere condolences on your Dad’s passing. Hoping the great memories together support and comfort you in this difficult time. All our prayers and thoughts here at IHSA are with you and your entire family. Eileen, Jackie, Andrea, and Colin, so sorry to hear about Tom. I know he has left you with many fond memories, and certainly lots of stories to make you laugh. I hope you can draw on those to make it through this difficult time. Thinking about you all and sending hugs. Jackie and family, I am so sorry you have said ” bye for now” to your Dad. Thoughts and prayers are with you. Hugging you in my heart. Jackie I’m so sorry to hear of your Dad’s passing. Please God give you and your family strength as you grieve. May your Dad rest in peace. Eileen and family. So sorry to hear of Tom’s passing. Sincere condolences to the family. Cherish the memories and may it be some consolation to know that others are thinking of you and praying for you. RIP Tom. God bless. Eileen, Jackie, Aundrea, Colin, and families . . . .deepest sympathy from our family to yours. Sending you and your family our condolences during this difficult time. May you hold close all the great memories that you have shared over the years to bring you comfort in the days ahead. Debbie (Burton) Palmer & family. Jackie and family, I am so very sorry to hear of the passing of your dad, may the memories you have of your dad help you through the following days. RIP Mr. Manuel. To the Manuel family. I worked at NLCS many years ago and Tom was one of my clients at MCP. I have good memories of him. He was knowledgeable, professional and a pleasure to work with. I always liked him. I’m sorry to hear of his passing. My sympathy goes to all of you during this difficult time. To Eileen and family – Sorry to hear of Tom’s passing. I remember him as a relative and through his work with the Scouting Movement in St. John’s. Please accept our condolences. Jackie & Craig and the Manuel families. Please accept my deepest condolences. I know that losing a father is never easy but know that the best of him lives on in you. I’m so sorry to hear of Mr. Manuel’s passing last night. Memories of all your good times will help sustain you at this very difficult time. Unfortunately, we’re over in NS so won’t be able to attend his service. Prayers & thoughts are with you all. Dear Jackie, So sorry to hear of your dad’s passing. We hope that you will be sustained by your good memories as you are surrounded by your family and friends. May he rest in peace.